When you think of luxurious socks, you’ll usually think of sheep and goats. Sheep’s wool has had a monopoly on warmth for centuries, while the wool from cashmere goats are what people think of for softness. The one animal that people don’t usually think for both warmth and softness of is the American Bison. But if the socks I’m wearing right now are any indication, it’s time to think twice. First of all, a little about the American Bison. For years, people referred to these animals as “Buffalo”. From Jimmy Stewart and Donna Reed singing “Buffalo Gals Won’t You Come Out Tonight”; to the name of the city of Buffalo, New York and the Buffalo Bills; to the biggest celebrity of the late 1800’s, Buffalo Bill Cody; to the design of the nickel that was used from 1913-1938, this animal has left an indelible mark on the United States. Here’s something you might not have known. In the United States the buffalo was never a buffalo. It’s more accurately called a bison. Specifically there are two subspecies, the plains bison (B. b. bison) and the wood biston (B. b. athabascae). In fact, it’s only distantly related to the true buffalo that you’ll generally find in Africa. But the malapropism stuck and so for the foreseeable future you’re going to hear people using the word buffalo and bison interchangeably. When the first settlers came to North America there were tens of millions of them. But with westward expansion came the loss of their natural habitat and uncontrolled hunting. By the year 1900 the number got down to as little as 300. The largest animal in North America was at the brink of being gone. Even to the time I was in grade school in the 1970’s we were taught how buffalo were endangered and at the brink of extinction. What happened next is a model for success in terms of stopping the extinction of an entire species. In the public sector, laws like the Endangered Species Act and the National Park System helped bring awareness to what Americans were doing to this animal. Just a few weeks ago on National Bison Day, Colorado State University published a Vine that showed bison being returned to their old stomping grounds in Northern Colorado for the first time in 150 years. And in the private sector, the American bison was brought back from the edge of extinction through methodical breeding and building up livestock herds. And happily, we’re at a point today where they have been removed from the Endangered Species list. By the year 2000 the number was about 360,000 and today they number more than half a million. So when you see bison meat on the menu, don’t think of it as akin to a dodo bird or passenger pigeon sandwich. It’s actually quite tasty (the reason it was hunted to near extinction), and good cuts will taste as good or better than cattle beef but with less fat and cholesterol. But like I said, something I would never have guessed is how amazingly comfortable bison down is to wear. While the animal looks pretty rugged on the outside, they have an inner coat of incredibly soft down. And when this down is spun it has a consistency that’s genuinely as warm as wool but soft as cashmere. One thing I’ve discovered about socks is that you really do get what you pay for. For years I bought socks at BJ’s that were made in China. They look decent, but after just a few wearing I noticed threads would start to unravel or there’d be holes in them. So ironically, while I’d maybe pay $3 for a pair of socks I used to pay $10 for, I’d go through five of those cheap socks before the one I paid a little more for would even show signs of wear. 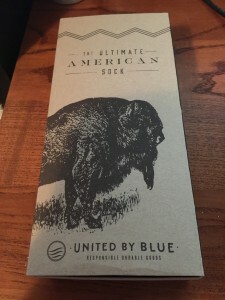 I had a chance to try out some bison down for myself, a product called The Ultimate American Sock from a company called United By Blue. I got the box in the mail, and right away I could see that this was a high quality product just from the box. Opening the box I saw the thick socks. Again, I’m used to buying cheap, thin socks stuffed into plastic bags so these looked gigantic to me. 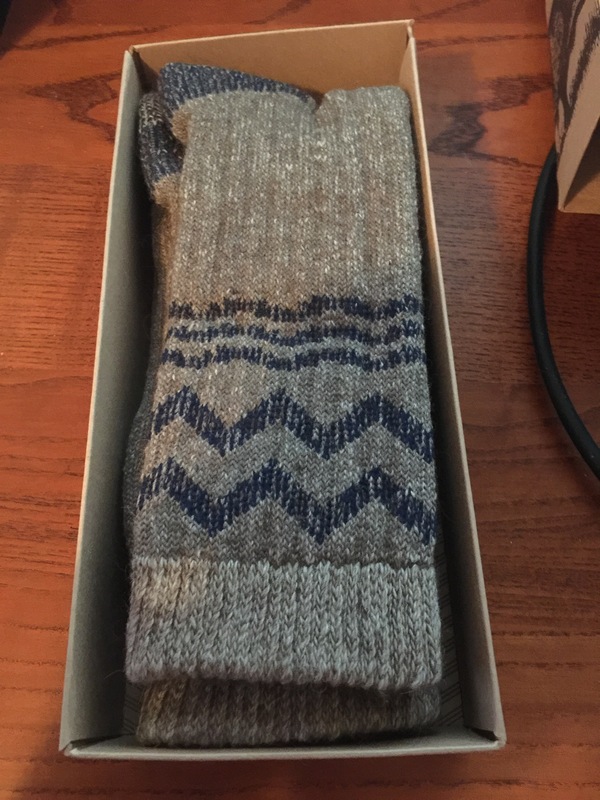 The craftsmanship of the socks is beautiful. Not a stitch out of place. You can tell just by feeling them that these aren’t going to wear out after just a few washings. But I still had to be convinced. I’m someone who doesn’t like the scratchiness and abrasiveness of sheep’s wool, so I wondered to myself if I would really like these. Putting on these socks, well, knocked my socks off. I was hesitant as I slipped on the first sock, expecting the usual sandpaper-like sensations you get with wool socks. But these socks were amazing. The softness is easily comparable to cashmere as far as feeling soft, smooth, and gentle. They do this by making a blend of merino wool, bison down, nylon, and spandex. They actually have a whole page that talks about the impressive engineering where every detail was thought of, from the spandex rib knit welt to keep your sock up without any irritation, to how they reinforced the toe and heel with nylon, to the rib arch support that helps circulation in your feet, to its moisture wicking capabilities, to the flat and reinforced toes seam. 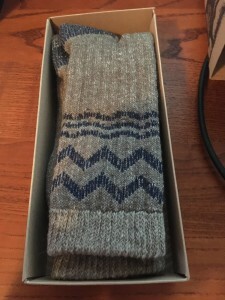 When I put them on they just slipped on and instantly enveloped my feet with a warm cozy feeling, which was perfect on the first cold autumn day of the year. I got up to walk in them and it’s like walking on a cloud of pillow, thanks to the padding on the soles. The thickness is not only great for warmth and comfort, but as the day went on I could feel them wicking the moisture, which makes these ideal for when you’re doing a lot of physical activity in the cool months. 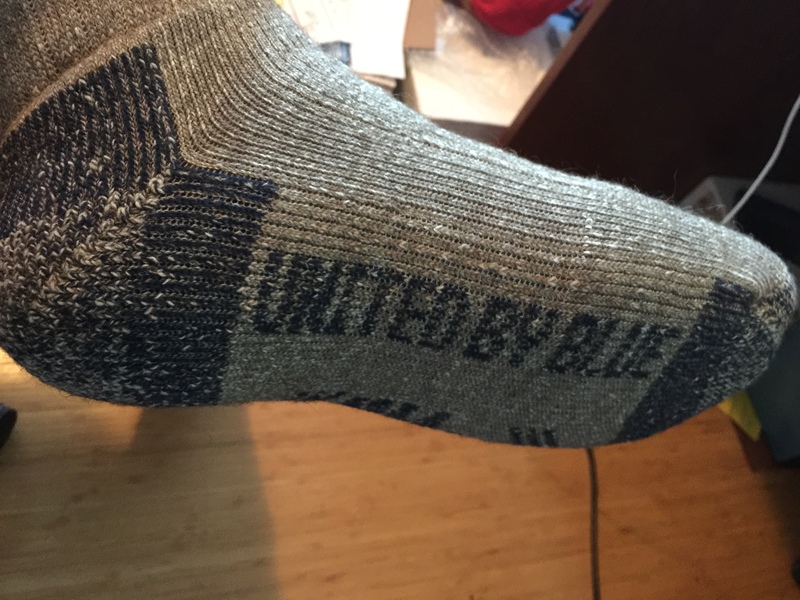 Here’s how comfy they are–my original intent was to review them and chance back into my regular socks for work. But I decided to just leave them on all day. 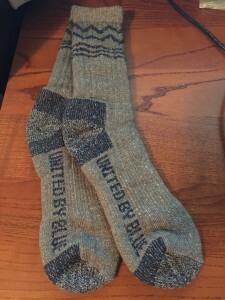 If you look through United By Blue’s catalog you’ll find the socks and also other new products like a bison down jacket. 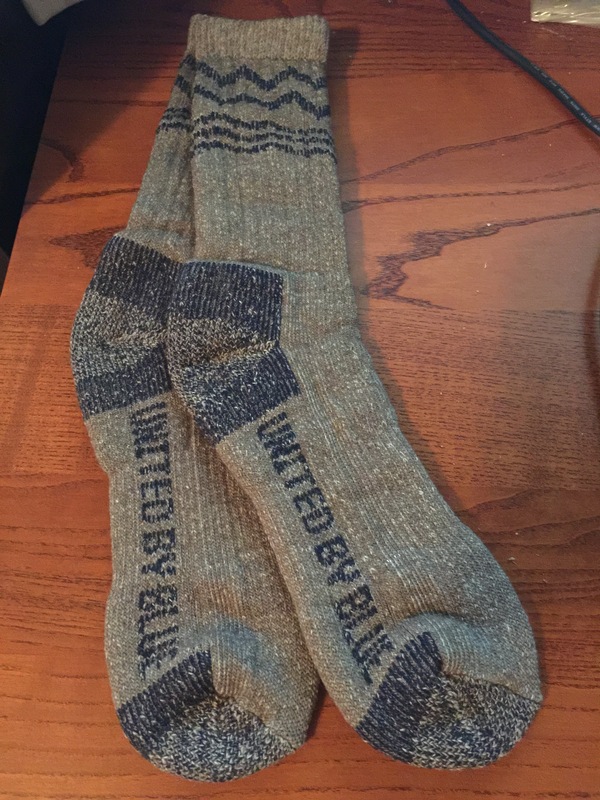 You might have a hard time justifying $38 for a pair of socks, but these are not only more comfortable and durable than almost any other sock you’ll be, it’s completely made in America. And “made in America” doesn’t mean like other companies they import foreign material as assemble it in the US. They designed the socks and packaging in Philadelphia, they collect bison down from ranchers in North Dakota, they blend the bison down with American Merino Wool and spin it into yarn in Massachusetts, and they knit and package them in Iowa into packages made in Wisconsin. It’s a great gift for the person in your life who has everything, because chances are they don’t have this yet! But something I appreciate most about this company is their charitable efforts focused on ocean and waterway conservation. Just as mankind almost decimated the American Bison population by careless, thoughtless and selfish actions against God’s creation, mankind is also just as careless in dealing with its rivers and oceans. I live in the New York area, and it’s heartbreaking to see what our fellow humans still do. It’s sad when the government needs to publish brochures warning the public against eating the fish that live in the oceans and rivers around us because of all the toxins in them, thanks to years and years of dumping by industry. And as much as has been done to clean up companies people are just as thoughtless on an individual level. I can’t go I go hiking in the woods or talking on the beach without seeing plastic food containers, bottles and cans, tires, candy wrappers. All it takes are a few selfish and thoughtless people, both on an individual level and a company level, to ruin it for everyone else, not to mention for future generations. Most of us see these things, shake our heads and say, “someone should really do something.” But then there are those that do. For every product sold, United By Blue removes one pound of trash from oceans and waterways through company organized and hosted cleanups. Specifically, they’ll organize and host ocean and waterway cleanups across the country, bringing together thousands of volunteers to pick up things like cans and bottles, tires, appliances, and everything else that makes its way into the aquatic world. So far, they’ve hosted 141 cleanups and removed 252,042 pounds of trash from rivers, streams, creeks, and beaches across 23 states. You can see photos and even sign up to participate yourself here. Great product, great cause, this is just the sort of product I love to highlight on this blog.